China completes the tests of its latest fighter. Chinese engineers say that J-11BS represents the aviation of the fourth generation. Foreign experts say that the Chinese have actually stolen the idea of the fighter jet from Russia. China’s latest J-11BS fighter was unveiled on April 10. The development of the aircraft is to be finished by the end of 2009. The serial production is to be launched in 2010. Chinese engineers have not offered anything new. 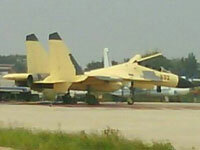 The J-11BS is a two-seated modification of the J-11B, which appeared in China as a result of an international scandal. China purchased a batch of Su-27 SKK from Russia in 1992. The country later said that it would like to build its own fighters on the Russian license. Russia then received orders for the two-seated version of the same aircraft – Su-30 MKK. The miracle of the Chinese aircraft-making company Shenyang Aircraft Corporation (SAC) took off in 1998 – the J-11 aircraft, which was actually a licensed product. China ’s military administration said six years later that it no longer needed licensed fighter jets because their battling capacities did not match the country’s needs, as it was said. China had 95 new J-11 aircraft added to its arsenal; the planes virtually represented Russian fighter jets assembled in China. However, China proved to be unable to develop the production of aircraft engines, and the country continues to purchase Russian engines for Su-27 MKK and Su-30 MKK, which supposedly do not meet China’s demands. In February 2007, China represented J-11B, which bore a striking resemblance to Russia’s Su fighters, as US experts wrote. China is currently working on the deck-based version of the Su-27 aircraft. The country apparently uses its previous experience and copy Russian fighters for it. Therefore, Russia refused to sell deck-based Su-33 to China in 2008.